I’ve returned early from Spain, arriving in the States last night. I walked only about 110 miles on the Camino de Santiago, from St. Jean-Pied-de-Port to Logrono, before deciding that it was time to come back. During my short time on the walk, the Camino gave me what it could, and I gladly accept the gift, but I felt the remaining miles had nothing more to offer. Following the Camino’s yellow arrows day after day, while comforting in their promise of direction and safety, is too structured an experience. This, the cultivated landscape, and the crowds of walkers contribute to a feeling of limitation. I seek to find my own paths, and to forge my own way. Only by traveling into the unknown can we explore our selves. And so, despite the cultural differences, despite the linguistic barrier, and despite the unknown country, I think the Camino is flawed. There are no yellow arrows for the mind, save for those we paint our selves. For me, it must be a journey wilder than this. One for which I do not have my way painted upon the landscape. A journey in which I am dependent on the self, alone in a solitary wilderness. To explore that is to touch the crevices of consciousness, running one’s finger upon the peculiar bumps of its surface. From the 21st of June till the 1st of July, I walked, taking a day off in Pamplona and in Viana. In Logrono, I spent 3 nights before taking a train back to Madrid, where I’ve been for the past week. I continue my pilgrimage elsewhere. This post was published on 2008-07-12 . It was modified on 2012-09-15 . 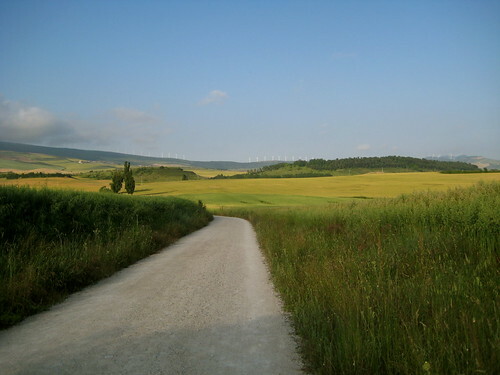 It was tagged with camino de santiago, the road, spain, france.